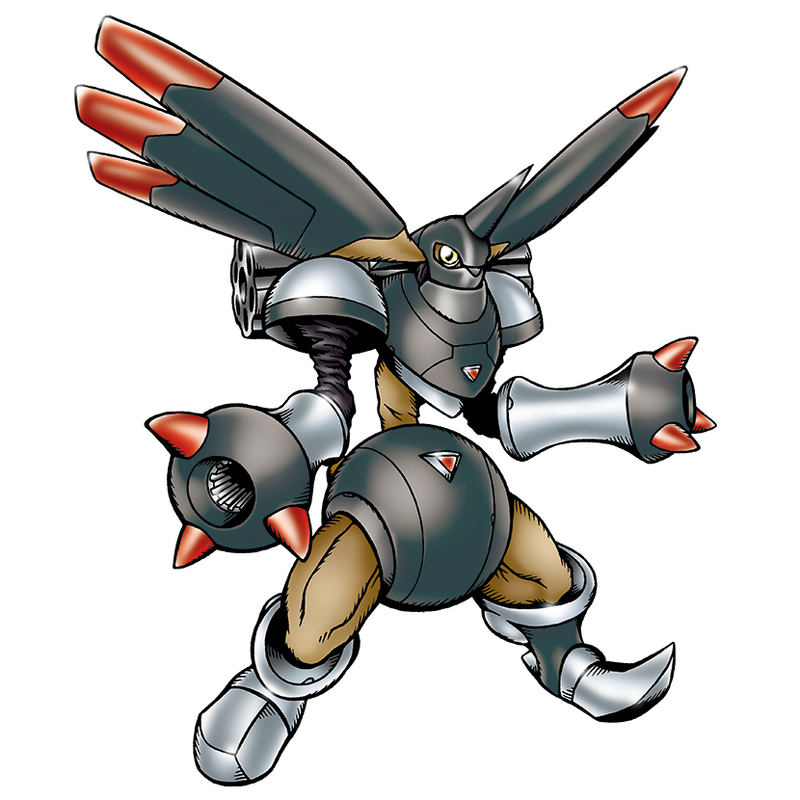 A Rapidmon whose body was dyed black. He shoots homing missiles to attack. 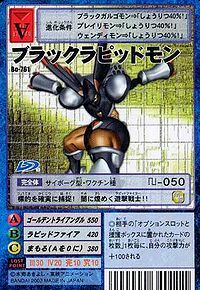 A Cyborg-type Digimon who attacks the enemies with a fast move near the lightspeed. To take full advantage of the ability to act in the dark, makes full use of the huge ear-type radar, the color of his body has turned black compared to the normal Rapidmon. Like the usual Rapidmon, the neck protector is closed during battle. 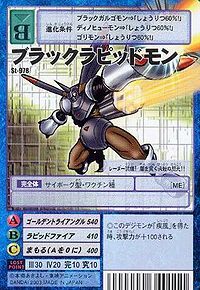 Golden Triangle  ゴールデントライアングル Gōruden Toraianguru Golden Triangle\Miracle Missile Fire a light beam from its whole body that disassembles its enemies. Fire homing missiles from his arms. 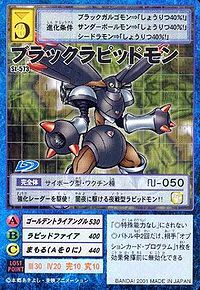 Can be evolved from Galgomon if above level 41 and Darkness EXP above 4000, or can be found at Lava River. He can evolve to Black Saint Galgomon if above level 55 and Darkness EXP above 20000. Can be evolved from Centalmon if above level 33, speed 145, and Machine EXP 3500, or can be found at Process Factory. 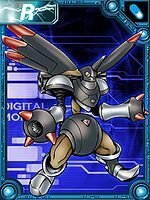 Can evolve to Black Saint Galgomon if above level 50, Darkness EXP 8000, and Machine EXP 8000. Making use of a strengthened radar, this nocturnal-type Rapidmon dashes through the night!! Radar equipped! The flash from its special technique pierces through the darkness!! It never fails to capture its target! A rapid fighter who shimmers in the dark!! This page was last modified on 10 January 2019, at 16:41.